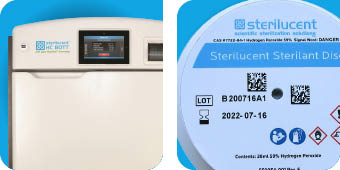 Sterilucent, Inc. is a health care company that develops and markets vaporized (gas) hydrogen peroxide technology offering effective and innovative sterilization products. Our products ensure that medical devices are safe and properly presented for patient procedures. Our mission is to improve the ability of health care providers to deliver quality care through the use of effective, efficient and easy-to-use, state-of-the-art and environmentally-sound infection control technologies, products and services. The result is long-term corporate growth and sustained stakeholder value. Sterilucent was founded in April 2004, when the company received initial funding from the National Institutes of Health (NIH). At that time, the company was known as Phygen, Inc. Sterilucent succeeded in obtaining additional funding from the NIH, Department of Defense (DoD) and angel investors to develop its sterilization technology. The company officially divided from the Phygen in July 2007 and was renamed Sterilucent, in April of 2008. To date, the company has received significant funding from the NIH and DoD for the development of a hydrogen peroxide sterilizer to support combat surgical hospitals in their mission to deliver safe, quality care to wounded service members.